I make these almost weekly for my family. I have virtually stopped buying frozen french fries, because my family and I really prefer these. I try to stay as unprocessed as possible, and this is one way to do it. Yes, I am eating/serving fried food, but I rationalize that with the fact that they were a whole food when I started, not frozen in a bag. Let me have my fantasy. That being said, these fries represent for me one of my first realizations that my mother is a food pusher. My mom made these from time to time when I was growing up. They became a regular side dish to hamburgers. She cut hers thicker and fried them in Crisco, making sure to stir them when they got soft so the potatoes broke slightly and got all crunchy and greasy. Mmmmm...my mom makes the best fries. When I was in high school my boyfriend would often come over hungry after our family had already eaten dinner. On more occasions than I think was reasonable, my food pusher mother would light up the gas grill and cut up a couple of potatoes and make a fresh burger and fries for Rob. Seriously. Either she was very happy that I had a boyfriend or she's really THAT hard-core of a food pusher. It was probably some combo, really, but looking back, it makes me laugh that she went to such lengths to make her "guest" happy. The take-away for me is this fabulous fried side dish. The cooking method here, though, I learned from Cook's Illustrated. 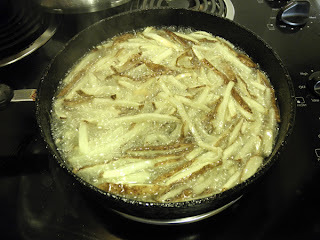 In one of the issues I have lying around my house, they did french fries, and their recipe called for starting with cold oil. Now, they didn't take into account that I would probably want more than one frying pan could hold, so I just add the second batch to the hot oil, and they turn out fine. The cold potatoes bring the oil temperature way down at first, and then it all heats up in a couple of minutes. I honestly can't tell the difference between the first batch fried and the second. They all get eaten at any rate. Scrub potatoes under running water. Using a very sharp knife, slice potatoes lengthwise into about 1/6-inch slices. Set end pieces to the side. Separate the sliced potato into to halves with the largest slice on the bottom and slice into 1/6-inch strips for long skinny fries. 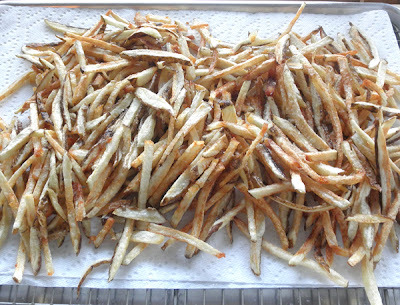 Place raw fries into a large bowl half filled with cold water. Slice the end pieces into strips as well and add to the cold water. Repeat with remaining potatoes. Stir the raw fries in the water with your hand and drain the water. Fill the bowl again to cover the potatoes. Allow to sit up to 8 hours in the water. If it's going to be longer than an hour, go ahead and place the bowl in the refrigerator. When you're ready to fry, preheat your oven to 200 degrees Fahrenheit. Place a metal cooling rack in a metal sheet pan (if you have those things) and cover the cooling rack with two layers of paper towels. In a high-rimmed, old, yucky frying pan, pour in enough canola oil to go about 1 1/4 to 1 1/2 inches up the side, making sure you still have about 1 1/2 inches above that. Drain your potatoes and either dry thoroughly with a towel or paper towel, or place in a salad spinner and spin until pretty dry. I stir with a paper towel in my hand to make sure they're even dryer. Place 1/3 to 1/2 of the potatoes into the oil and THEN turn the heat on to medium-high. Bad lighting, but you get the idea. 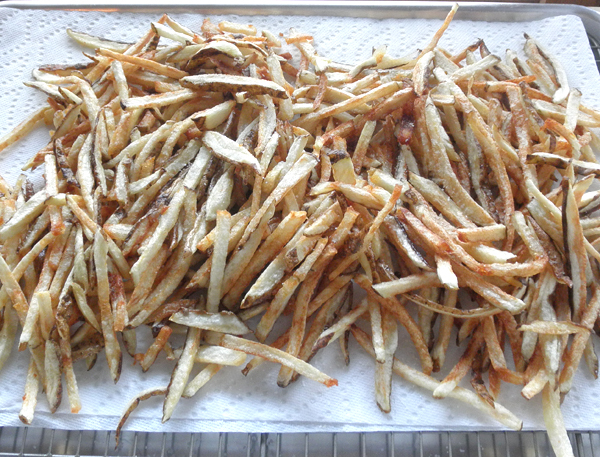 Allow french fries to fry until light golden brown, and then stir carefully with a screen skimmer or slotted spoon. 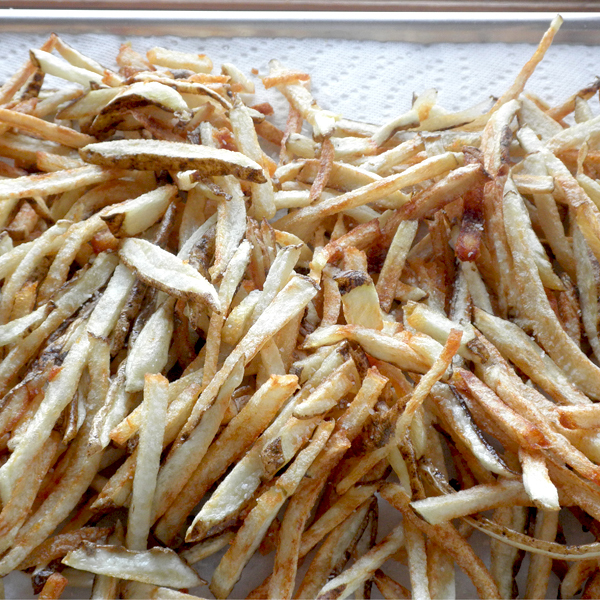 When fries are the desired color (deep golden brown for me), carefully remove with the skimmer or slotted spoon to the prepared paper towel-lined rack. Sprinkle with salt. Place in the warm oven until the next batch is ready. Carefully place 1/3 more or the remaining raw fries into the oil and fry the same way as before. They will go a little faster this time since the oil is already hot. Makes 5-6 servings, or 4 if you like fries as much as we do. Those look so good!!! How long does it take to fry a batch? That is a good question. I'd have to say approximately 10 minutes. Maybe a little longer. I need to time myself next time I make these, but it's around 10 minutes.